Can the offseason transactions made by the Calgary Flames move them to respectability and the playoffs? Or will some crazy things need to happen? Will the Calgary Flames be able to excel with the roster changes they've made? Or, will they need to make some more dramatic additions to get to the playoffs? Well, they've added some good players like James Neal, Noah Hanifin, and Elias Lindholm to their arsenal. They do have an aging goalie in Mike Smith, and no serviceable backup which was evident last season when Smith looked fatigued. He will be 37 in March. On the bright side, anytime you possess a talent like Johnny Gaudreau you have a fighting chance to be playing in the postseason. Last year they looked to get to the playoffs only to lose 10 of their last 12 games to seal their fate. Let's see then what crazy predictions might come true for this club when the season begins later this week. Newly acquired forward James Neal will be a huge success on the first line and when you have Gaudreau as your linemate good things tend to happen. He will score 32 goals and 75 points to challenge Gaudreau for the team scoring title. In fact, when you analyze that top line it becomes pretty apparent that they will have the firepower to dominate games. Totaling up all three participant's (Sean Monahan, Gaudreau, Neal) offensive contributions from last season it can show that the opposing team's defense will be beyond busy. The trio tallied 80 goals, 112 assists and 17 power play goals to show they can be very competitive offensively. They do need to improve on their meager power play which only converted on 15.99 percent of the extra man opportunities presented to them. Noah Hanifin, who signed a six-year $29.7 million contract after being traded to the Flames may not be able to immediately replace a quality blueliner like Dougie Hamilton, but at just 21-years-old he's got lots of time to figure it out. The Flames got younger and Hanifin had better pan out or that huge contract will look like a blunder if it doesn't. Of his 83 points in the NHL, he has 21 on the power play and he was on a weaker team. The Flames are throwing in all their marbles (all 29.7 million of them) in hopes that Hanifin can be a top-four or even top-two defenseman. His skills will be shining more in Calgary (a hockey hotbed) rather than in Carolina where the team was rumored to be moving and their attendance was poor at best. With that being said Hanifin will go on to gather 15 goals, and 45 points to show he belongs in Calgary and will earn his 29.7 million marbles. Every knowledgeable hockey fan knows that Mike Smith took the Arizona Coyotes on a wild goose chase bilking them out of millions after his successful one season during the Coyotes' heyday back in the 2011/12 season. He is in the last year of his ridiculous six-year $34 million contract and the Flames will lose their patience (just as the Coyotes should have) and see what he is worth (if anything) on the trade market. It may be a tough endeavor with his age and declining health issues, so riding him through this last season may be all they can do. Not having a reliable backup will put the Flames in a precarious position if (or maybe more adeptly put WHEN) he goes down with an injury. With young and inexperienced Jon Gilles penned in as Smith's backup his 12 games of NHL experience doesn't seem like an adequate safety net... to say the least. Anybody need a washed up soon to be 37-year-old goalie? ​At just 5'9", 157lbs Gaudreau has been injury free... up to now. With the average NHL player getting bigger and stronger, his weak frame will take a beating. His speed and scoring abilities along with his passing prowess will distinguish the Flames offense and it's not be easy to replace a superstar like Gaudreau. Of course, injuries are part of the game and no team or team's management can predict whether they will sustain injuries. Gaudreau is a tough competitor and will fight back if he gets injured. Let's all hope this prediction doesn't come true. ​Now, granted the Calgary Flames have some talent and a great top line, but so does the competitive Pacific Division. If things can fall into place and prediction # 4 or #3 don’t occur they have just as much of a shot to move up the standings ladder as any team. Gaudreau is an outstanding and ominous force and adding Neal to the mix on his line just gives the swift playmaker more tricks in his bag of offensive goodies. 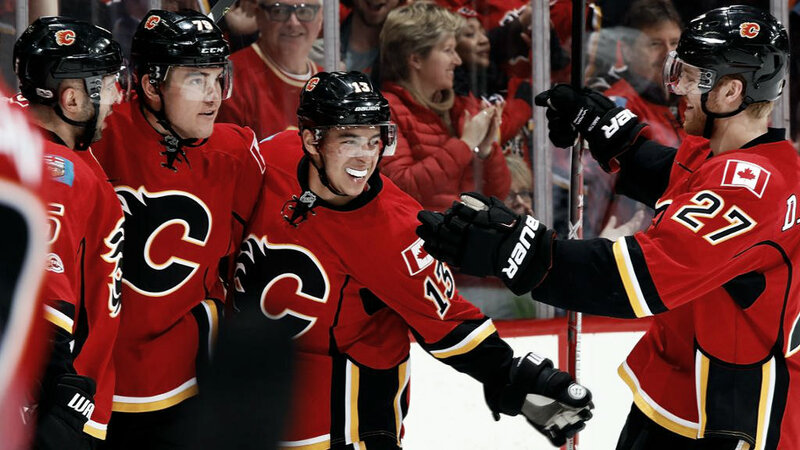 Look for the Flames to finish higher in the Pacific catapulting them to the third spot and assuring them of a playoff appearance after last season’s embarrassing showing. They should be able to collect 96 points and just edge out the Los Angeles Kings for a playoff spot. And yes… Mike Smith goes on to help his team even if he may be eligible for retirement pay soon. ​What are your impressions of these predictions? Too crazy, not crazy enough? Let us know in the comment section below, and make sure to give us a follow on Twitter (@VAVELNHL_ENG) for more updates!